Hassan MASSOUDY was born in 1944 in Najef, South of Iraq. He grew up amid the scalding heat of the desert, in a traditional Iraqi society characterised by strong religious beliefs, a high sense of solidarity and a keenness for festive gatherings. As a youngster, in this town where all images were prohibited, he fulfilled his passion for art by making drawings and calligraphies while investing all his energy to get paper and pigments. In 1961 he left for Baghdad and started working as an apprentice for various calligraphers. He visited exhibitions of modern art which fascinated him and from then on, started to dream of studying art. The unfolding political events and ensuing dictatorship prevented him to do so. He eventually left Iraq for France in 1969, freed from the oppressing regime but heartbroken. He got to the “Ecole des Beaux-Arts” of Paris where he first worked on figurative painting. But he did not stop calligraphy altogether; to pay for his studies, he was doing headlines in calligraphy for Arabic magazines. Over the years, calligraphy progressively got into his figurative painting and eventually took its place. In 1972, he created the show “Arabesque” with the actor Guy Jacquet joined a few years later by the musician Fawzy Al Aiedy. Arabesque was a public performance combining music and poetry together with calligraphies being performed and projected on a large screen. They did many performances across France and Europe over a period of thirteen years. Over the years, it brought more spontaneity in his gesture and a more instantaneous way for him to express himself. This experience marked a definite turn in Hassan’s work. The drawing of his calligraphy became swifter and his gesture richer. Traditionally Arabic calligraphy is done with black ink. To better express himself, he broke from the tradition and introduced other colours particularly on his work on large size paper. While creating new pieces, he put together on his own, another show focusing on improvisations called “Calligraphie d’ombre et de lumiere” or “calligraphy of light and shade” (see details for public performance in exhibitions and events). In that new show, calligraphies are created in front of the very eyes of the spectator; black letters contrasting with light. Phrases, words and letters are projected on the screen. With calm and control, each letter takes shape flowing freely in the bright light. Then the movement accelerates, the word charged with energy eventually finds its perfect balance. The aesthetic, geometry and rhythms of the calligraphy are unveiled. The compositions are born. The dynamics of the gesture gives birth to poetry. In 2005 he met the dancer and choreographer Carolyn Carlson, and the musician Kudsi Erguner. Together with three other dancers and three other musicians, they created the show “Metaphore”, a harmony of music, dance and calligraphy. So how does a poem become calligraphy? How does the word become a sign? The value of beauty in classic calligraphers, to transpose a poem, was the perfection of style evolved according to rules and codes, known and respected by all. What the calligrapher could add was more life to the line he drew. Today, I feel that the process has changed: I focus my attention on poetic images. Which word stands out, should be magnified? I count the straight letters then the curves so as to be able to create a rhythm by composing them. I dream about those letters. I imagine the word in different styles of calligraphy. I sketch a few lines, transforming the letters, I move them around, adjust them. At the same time, the image of the poet is floating in my mind. Hazy at first. Certain images reveal themselves sooner than others, sometimes the very first day, sometimes after long months. This slowness means I haven’t yet pierced the mystery of the image. So I have to persevere. The line, as a dynamic force, and in its adequate relation with the meaning of words, must reflect two things: on the one hand strength and rigour, on the other abandon and grace. The line’s aspect must suggest a direction: a pushing or pulling gesture, quick or slow, heavy or light, calm or bursting forth. If the line is full of life, if it reflects emotion, then beauty is not far away. But beauty remains unknown and doubt is present. To imitate the aesthetic values of the old masters is only copying. The codes and techniques must be changed. They evolve with their times. To renew calligraphy demands a painful bringing forth, the permanent taking of risks. One has to detach oneself from all preconceived notions, absorb daily life. But one must also draw resource from manuscripts or broken fragments of monuments. I pare my calamus and make the broad instruments. I select my papers and prepare my colours on the same day they are to be used, mixing and fixing the pigments. The writing instrument, the paper and the colour, must all live in harmony, but this cohabitation is rarely harmonious right from the first gesture. Working with water-based paints and calligraphy both demand a flat working surface. Through the continual to and fro’ movements, to the point where you are united with the matter are one, you feel yourself becoming calligraphy. When I try to reflect the image of the poet in letters, or a form that dwells in me or even in an unexpected form, I enrich myself with a new line, won from the white expanse of paper. I am looking for, for my calligraphy, vast and unlimited space. The white in the background is also an integral part of that form, calligraphy also evokes space by its absence. It must be discreet and allow the eye to see what is invisible. The downstrokes and the upstrokes are the essence of calligraphy, a movement, an angle that defines the order of organisation in space. Those downstrokes and upstrokes express strength and fragility at the same time. Proportions are extremely important and are calculated to a hair’s breadth. This precision is intuitively perceived by the eye and the taste of the person viewing the calligraphy. Each form – through its pictorial content, its density, its height – lets us feel the pressure of space and the struggle with gravity. It is aesthetic writing, legible to the educated eye. How many times have I felt moved by a curved tree? Then my eyes move on to a second, thinner, more vertical; whose flow of sap nourishes the highest branches. Going into my workshop, I try to find the attitude of the tree. My letter must be as vigorous as the branch. Calligraphy is an art that puts down the essence of things and not just the visible. All the difficulty lies in the dialogue with the invisible. The sketch is only an indication, the dreamed-of form is never fully realised. The result is partly achieved by chance, in spite of all the preparations for a good start. If the binding agent in the ink lacks the necessary quality or the instrument is badly sharpened, it’s enough to make the whole thing flop. But the opposite is also possible. After a tiring day’s work, a moment of relaxation comes when nonchalant and disobedient gestures take over the form. What amazement, what surprises! The work is freer. The gestures move through space without encumber, soar up without falling. They are broad without being heavy, fine without breaks, with fine proportions. The next day, I get ready to carry on what I was doing the day before. I’m sure I’ve struck gold. Alas, it’s back to square one, I can’t get back to the impulsion of the day before. Beauty comes and goes as it pleases. You have to persevere, to be attentive, reread the poetic phrase, look again at the images, imagine others. Begin again slowly, very slowly. Instead of looking at the letters, observe the light that moves around the calligraphic gestures. Go on, again and again, struggle with the matter, with this instrument-ink-paper trio, and the Word. This search for the right form is like seeking a point of balance where everything meets – weight rising without falling, dynamic movement that doesn’t break the form, light passing through colour, space adjusting itself behind the forms, purifying without impoverishing, achieving abstraction without loss of image – the meaning of words, the desire of the calligrapher. Finally, it is perfecting the self with each calligraphy, becoming more adept through mastery of the materials. The geometric construction of form should be very simple. If the exact point of balance is not reached, if it is a failure, then you discover your own limits, your humanity and the fragility of the human condition. Calligraphy can become an indicator of the absence of centre, of imbalance. This experience then evolves into knowledge of the self and perhaps even improvement if you pick yourself up right away and start again. A new direction, but how do you choose? Slow down to better master the rapidity or speed up to better gather the fruits of impulsion? One mustn’t lose the essential. If the ancient techniques are a hurdle, you have to set them aside and invent others, or take inspiration from the other arts, listen to the rhythm of music or observe the movement in dance. The word of the body is like a bird in space, but how can one float freely without falling? You need lots of stamina to overcome gravity and find the physical sensations of space. My calligraphy must reflect its belonging to the world, which now means an era of speed. The speed of the rocket that allowed man to overcome the law of gravity and gave him the possibility to walk on the moon. When I think my gesture is just right the interior conflict ceases, even if that sensation only lasts a few minutes. It is a moment of joy when the alphabet is no longer an instrument of logic but an attitude of writing, a pure sensation that can easily come into contact with the poet, who has probably been through the same process. This calligraphy reflects my vision of the world, it has become the desire that the world should be thus, with a new harmony and new freedom. The material contradictions are the reflection of contradictions in life. In reality, the point of balance doesn’t exist: The world is merely a harmony of tensions, according to Heraclitus. All this experience is only an evolution and there is no evolution without failure. Calligraphy is like all the other arts, the expression of happiness and suffering go side by side. Do and undo, and grow through each experience. Faced with a tragic impulsion, calligraphy imposes a restraint an control that allows you to deal with problems. One learns to master the self for a moment. When the word is lightness and soars up, the eye follows the upward direction of the movement. Intuitively, I see calligraphy on another scale than that imposed by the limits of paper. It gains in spatiality. The gestures of the calligrapher become an open space, welcoming the words of the poet and the imagination of the onlooker. على الرغم من كون اعمال حسن المسعود آتية من الخط العربي، فأنها تبدوا بمظاهر تشكيلية حديثة. وتعكس العصر الذي نعيش فيه. فهو يستعمل ألوان مستمدة من ديكور الزمن الحالي. يحضرها حسب وصفات قدماء الخطاطين، من المساحيق الملونة المتوفرة حاليا ً والصمغ العربي. وكذلك يحضّر هو نفسه ألآت الخط من القصب، وأخرى حديثة يبتكرها. تشكيلاته الخطية يبنيها كتماثيل عالية في الهواء الطلق. ديناميكية الحروف في لوحاته مستلهمة من الاجواء التي يعيشها. فقد امضى أكثر من ثلاثين عاما في العمل الفني مع ممثلين وراقصين وموسيقيين. يستعمل الخط كوسيلة تعبيرية مع الفنون الأخرى. بهدف دفع الخط العربي إلى عوالم جديدة. وكذلك لعكس احساساته كفرد يعيش في أوروبا ولكنه على اتصال مستمر مع الشرق. تكوينات حسن المسعود لاتنكر ارتباطها بالأرض. فهي وتبقى واقفة على الخط الافقي في اسفل اللوحة. بينما تصعد الحروف متموجة كانسيابية الماء وحيويته. من اجل ان تعبر عن شرارة القلب. في شكل خفيف وقوي كالرياح الراقصة في النور الساطع. عندما يخط كلماته على الورق، انما يصبح هو نفسه الحروف، فيخط الصور التي تترآى في مخيلته. فأن كان العالم بخير ففي ذلك اليوم ستكون الخطوط راقصة ومرحة. وبالوان زاهية. ولكن ان تكون أخبار الإنسانية محزنه، فان الخطوط ستكون كذلك. بدل الانفتاح سوف تنغلق الكلمات وتثقل. والالوان سوف تميل إلى الظلام. يستلهم حسن المسعود الكثير من تكويناته الخطية من الشعر والحكم والامثال. فان لا تاتي الايحاءات وحدها وبسهولة، فانه يقرا الشعر، وخصوصا الشعر القديم والشعراء العباسيين والاندلسيين. إلى ان تحفز مخيلته صور شاعر أو فكرة حكيم. أحيانا يأتي إلى الخط شيئا غامضا آتيا من الادب. ومرة أخرى ياخذ الشعر الثراء من الحركات الخطية، ومشاعر الخطاط. وهكذا يجد الشعر في الكتب القديمة مجالا جديدا. ليعود ويساهم في تنمية الوعي ونشر الجمال. خلال سنوات طويلة مارس حسن المسعود الخط. ولد في عام 1944. ورأى خطوط خاله الخطاط الهاوي وعمره خمس سنوات. وفي المدرسة الابتدائية والمتوسطة لاقى تشجيع ومساندة المعلمين والاساتذه الفنانين بمدينة النجف في جنوب العراق. عام 1961 يتوجه إلى بغداد للعمل مع الخطاطين هناك. فيتعلم الاساليب التقليدية للخط العربي والادب المحيط بعالم الخط. ولكنه بنفس الوقت كان يحب الرسم والتصوير الزيتي. ويحلم بالذهاب إلى باريس. للدراسة في المدرسة العليا للفنون الجميلة ” البوزار “. تحين له فرصة السفر إلى باريس عام 1969 فيعيش خمس سنوات في هذه المدرسة. ولدفع مصاريف الدراسة لايجد سوى اعمال بسيطة للخط العربي. وهكذا يبقى الخط العربي معه في باريس، بطريق مواز للفن التشكيلي. وعندما يحصل على الدبلوم العالي في الفنون التشكيلية. يعود بكامل طاقاته نحو الخط العربي. فان اجواء باريس توحي له ان عالم الصورة الذي جاء يبحث عنه، يعاني هو نفسه من التياه، بسبب تطور وسائل التصوير من كل الاشكال. فيرى حسن المسعود ان المظهر التجريدي في الخط العربي يمكنه ان يكون الوسيلة التي يريدها للتعبير عن احاسيسه وافكاره. يرى ان الخط العربي يمكن ان يكون تعبيرة التشكيلي من الآن فصاعدا ً. فيرجع يدرس الخط العربي القديم بشكل واسع وعبر وثائق وصور عن الخط في العراق. ثم عمل سفرتان إلى تركيا ومصر في الثمانينات ليلتقي بالخطاط حامد الامدي في إسطنبول وبعض خطاطي مصر في القاهرة. وعمل الكثير من الصور للخطوط في المعالم المعمارية. ودرس وثائق عديدة في المكتبات والمتاحف. وأخذ يحللها فنيا ً فيكتشف ان الخط العربي في الماضي قد ازداد ثراء في كل قرن. عبر الاضافات العديدة لاجيال الخطاطين. من الاساليب المتعددة التي ولدت في بغداد والقاهرة وإسطنبول. أو بتاثير الشعوب المسلمة المتباعدة. كانت هذه الابتكارات تتم عبر الخط في الكتب أو على الجدران. وكان الخط سابقا ً هو فن الدولة الرسمي على المعالم المعمارية، وهو أيضا الفن الشعبي في اعمال المهنيين. وعبر الوثائق في المتاحف. وماهو باق من الخطوط على الجدران للمعالم المعمارية، استطاع حسن المسعود ان يتعرف على أهم منتجات الخطاطين ما بين القرن التاسع والقرن التاسع عشر. الف عام من الابداع للخطاطين على اتساع الدولة الإسلامية الكبيرة. هذه الدولة الكبيرة التي كانت متفتحة على الثقافة المحلية للشعوب الإسلامية المتعددة من الهند وحتى الاندلس. لاحظ حسن المسعود ان الخط العربي هو جزء منسي من تاريخ الفن العالمي، فعمل كتابا اسمه ” الخط العربي” عند دار نشر فلاماريون بباريس، عام 1981 باللغتين العربية والفرنسية. ليسد الفراغ في المكتبة الغربية. ولا زال يعاد طبعه لحد اليوم. مارس حسن المسعود باستمرار الخط امام الجمهور منذ عام 1972 بمعدل لقاء واحد كل اسبوع. جعل الكثيرين من أبناء المجتمع الاوربي يتعرفون على الخط لحظة ولادته إذ يستعمل حسن المسعود الأجهزة المعاصرة لتصوير الخط، عند عمله ويرسل مكبرا على شاشة كبيرة، امام عيون المشاهدين كما في السينما. ويعمل دورات تدريبية للخط العربي واللاتيني منذ سنوات. الهدف منها استعمال الخط كوسيلة تعبير والتنفيس عن العالم الداخلي للإنسان. إذ ان الخط يرتبط بالتنفس والطاقة والهدوء. وكيفية تحرير الصور في مخيلة الإنسان. وتتوجه هذه الدورات للكل. من كل الاعمار. ومن كل المهن. ومن كل المستويات. ساهم في الخط مع فرق رقص كلاسيكي مشهورة عالميا ً. حيث يمتزج الخط العربي في حركات انسيابية مع اجسام الراقصين وظلالهم. وقسم من هذه العروض دخلت الأماكن الفنية الرسمية، في بعض البلدان الاوربية. مما جعل الخط العربي يتجاوز محيطه التقليدي نحو العالمية. يلتقي حسن المسعود بخطاطين من تقاليد مختلفة. وعرضت خطوطه في متحف اوساكا باليابان وعمل خطوط امام الجمهور بنفس المتحف. والتقى بخطاطين يابانيين وعمل معهم بهدف معرفة كنه اعمالهم. وماهو جوهري ومهم في الخط الياباني. وما هي إمكانيات التقائه بالخط العربي. كما التقى وعمل مع خطاطين من الصين في باريس. بهدف اثراء تجربته في تطوير الخط. ووجوده في أوروبا منذ عام 1969 جعله يهتم بالخط اللاتيني. فتعلم عدة اساليب من هذا الخط. ويعطي الآن دروسا ً للاخرين عن كيفية استعمال الخط اللاتيني كوسيلة تعبير فني. يعرض حسن المسعود اعماله الخطية في أماكن ثقافية بمختلف الدول الاوربية منذ الثمانينات. والف عشرين كتابا عند دور نشر كبيرة في باريس. كتب عن الخط العربي القديم أو كتب تتناول خطوطه كلوحات. أو الخطوط التي عملها مع نصوص من الادب العربي. وبعض كتبه مترجمة إلى لغات أخرى. كما عرضت افلام عن اعماله في تلفزيونات عالمية. خطوط حسن المسعود دخلت ضمن مجموعات متاحف عديدة في العالم : منها المتحف البريطاني. ومتحف الشارقة. ومتحف كه برانلي في باريس. ومتحف اوساكا في اليابان، وعدة متاحف هولندية. موقع على الإنترنت يتناول اخر الأخبار ومعلومات عن الكتب والمعارض والعديد من الخطوط الحديثة. – 1944 ولد الفنان والخطاط العالمي حسن المسعود بالعراق. – 1961 عمل خطاطاً في بغداد. – 1969 انتقل إلى باريس. – 1975 حصل على دبلوم عالي بالفنون التشكيلية، مدرسة البوزار، باريس. – 1976 حتى 1985 كون مع ممثل فرنسي وموسيقي عربي فرقة (الخمسة) التي طافت بفرنسا عبر الحفلات ومحاضرات ومعارض للتعريف بالثقافة العربية. – 1998عمل 36 فلم عن الخط كل واحد منها مدته دقيقتين ونصف، كما أقام أكثر من (60) معرضاً شخصياً في فرنسا وأوربا والدول العربية واقتنت أعماله بعض المؤسسات العامة: مطار الملك خالد الدولي بالرياض، متحف الفنون الأفريقية بباريس، متحف “ستيدلجك” بمدينة “كود” بهولندا، المتحف البريطاني بلندن، عمدة مدينة “رزة” بفرنسا- متحف “وستفري” بهولندا، وشخصيات سعودية وخليجية. 1981 كتاب “الخط العربي”، دار نشر فلا ماريون، باريس. 1986 كتاب “حسن المسعود الخطاط”، دار نشر فلا ماريون، باريس. 1989 كتاب “شاعر الصحراء عنترة”، دار نشر الترناتيف، باريس. 1990 كتاب “تعليم الخط العربي والخط اللاتيني للمبتدئين”، دار نشر اديفرا، باريس. 1991 كتاب يضم نصوص من كتاب جبران “النبي” وخطوط، دار نشر الترناتيف، باريس. 1992 كتاب “حسن مسعود” طريق خطاط، دار نشر فيوس، باريس. 1995 كتاب “الاغتراب” نص لاتيني للكاتب سنك وخطوط لاتينية، دار نشر الترناتيف، باريس. 1997 كتاب “الحديقة المفقودة” نص الكاتبة اندره شديد وخطوط حديثة، دار نشر الترناتيف، باريس. 1997 كتاب “خطوط الأرض” نصوص من كل العالم وخطوط سوداء، دار نشر الترناتيف، باريس. 1998 كتاب “أنت خلودي” خطوط تزين شعر الكاتب الفرنسي جاك سلومة، دار نشر البا ميشيل. 1999 كتاب “سفر الطيور” خطوط تجاور نص الكاتب فريد الدين عطار ـ نشر الترناتيف ـ باريس. 2000 كتاب “رباعيات رومي” مختارات ـ نشر دار البان ميشيل ـ باريس. 2000 كتاب “خطوط الصحراء” دار نشر الترناتيف ـ باريس. 2001 كتاب ” نظام ” شعر ابن عربي ـ نشر دار البان ميشيل ـ باريس. 2002 كتاب “الفباء الخط العربي” دار نشر فلاماريون ـ باريس. 2002 كتاب “خطوط الحب” خطوط تزين شعر من العالم الإسلامي ـ دار نشر البان ميشيل ـ باريس. 2993 كتاب “خطوط الإنسان” خطوط ونصوص إنسانية ـ دار نشر الترناتيف ـ باريس. 2004 كتاب “ملحمة جلجامش” دار نشر الترناتيف ـ باريس. 2004 كتاب “بعيداً عن الفرات” ذكريات عن العراق ـ نشر البان ميشيل ـ باريس. 2006 كتاب “سندباد البحري” نشر الترناتيف ـ باريس. Hassan MASSOUDY est né en 1944 à Najef, une ville du sud de l’Irak. Il grandit dans une société traditionnelle marquée par la rigueur de la religion et la brûlure du désert, mais aussi par la joie collective des grandes fêtes et l’esprit de solidarité. Très jeune, dans cette ville où toute image est prohibée, il investit sa passion de l’art dans le dessin et la calligraphie et consacre toute son énergie à se procurer papiers et pigments. En 1961, il part pour Bagdad comme apprenti chez différents calligraphes. Il y apprend son métier. Il visite des expositions d’art moderne qui l’émerveillent et rêve de faire des études d’art. Mais il se trouve pris au coeur de la tourmente politique qui conduira à l’avènement de la dictature. Après de multiples séjours en prison, il quitte l’Irak pour la France en 1969, libre mais déchiré. Il entre à l’Ecole des Beaux-Arts de Paris. Là, il fait de la peinture figurative. Il n’abandonne néanmoins pas la calligraphie, elle lui sert à financer ses études en réalisant des titres pour des revues arabes. Petit à petit, la calligraphie va s’infiltrer dans sa peinture figurative, pour, à la fin, prendre sa place et la faire disparaître. En 1972, avec le comédien Guy Jacquet, puis rejoint quelques années plus tard par le musicien Fawzy Al Aïedy, il créé le spectacle Arabesque et commence à faire des créations publiques de calligraphie arabe projetée sur grand écran. Avec ce spectacle, mêlant musique, poésie et calligraphie, durant treize années, ils vont tous trois sillonner la France et l’Europe. Par cette pratique, Hassan Massoudy est à la recherche de la spontanéité du geste et de l’instantanéité de l’expression. Cette expérience marque un tournant dans son travail. Le tracé de sa calligraphie devient plus rapide et son geste plus large. Traditionnellement la calligraphie arabe se réalise principalement en couleur noire. Afin de mieux exprimer ses sensations, il va introduire la couleur dans ses oeuvres de grand format sur papier. Parallèlement à ses créations picturales, seul, il va continuer à faire des créations/improvisations en public, intitulées Calligraphie d’ombre et de lumière (voir la programmation éventuelle dans expositions et événements). La calligraphie naît sous nos yeux. Les signes noirs s’inscrivent dans la lumière. Les phrases, les mots, les lettres, sont projetés sur l’écran. Avec lenteur, se déploient les pleins et les déliés qui évoluent librement dans l’espace. Puis le geste s’accélère, le mot se charge d’énergie pour mieux maîtriser son équilibre. L’esthétique de la calligraphie, sa géométrie, ses rythmes, se dévoilent. Les compositions se construisent. La gestuelle dynamique donne vie à la poésie. En 1995, il participe au décor du ballet Selim, avec Kader Belarbi danseur étoile de l’Opéra de Paris et Houria Aïchi chanteuse, sur une chorégraphie de Michel Kalemenis. En 2005 il rencontre la danseuse et chorégraphe Carolyn Carlson ainsi que le musicien et joueur de ney Kudsi Erguner. Tous trois, accompagnés de trois danseurs et trois musiciens, vont créer le spectacle Métaphore où musique, danse et calligraphie vont vivre en harmonie. Ce spectacle fut créé au festival d’Istanbul en juin 2005, puis il fut interprété en 2006 en France à Dijon, Perpignan, Roubaix, Châlons en Champagne, et en Italie à Rome au Teatro Valle. 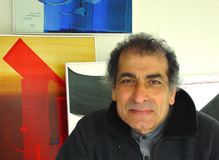 Les créations d’Hassan Massoudy sont le fruit d’une rencontre entre le passé et le présent, entre l’art oriental et l’art occidental, entre la tradition et la modernité. Il perpétue la tradition de la calligraphie tout en rompant avec elle. Il épure son trait, tend vers une grande simplicité de la ligne. Le contenu : les mots, les phrases qu’il calligraphie, ont été écrits par des poètes, des écrivains du monde entier, ou dits simplement par la sagesse populaire. Son oeuvre est traversée par une culture humaniste. L’émotion ressentie à la vue de ses calligraphies est procurée par le mouvement des lignes, leur légèreté, leur transparence, le rapport entre le noir et le blanc, le plein et le vide, le concret et l’abstrait. Hassan Massoudy a gardé de sa formation de calligraphe, en Irak, l’esprit noble de l’artisan qui fabrique ou invente ses outils et prépare lui-même ses encres à partir de liants et de pigments colorés.